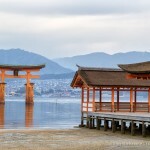 I had never heard of Japan’s Miyajima Island until I started seeing photos of its famous floating torii gate. Once we booked our two week trip to Japan, this iconic torii was added to my list of must-see places in Japan! 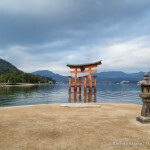 The Great Torii (O-Torii) stands at the sea entrance to Itsukushima Shrine and is regarded by the Japanese as one of Japan’s three most scenic views. The torii is most beautiful at sunset and at high tide, when it appears to float in the water. The first torii was built in the bay in the 12th century but the one you see today is from 1875. 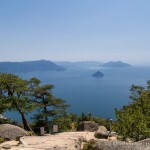 Miyajima’s Great Torii is 16.6 metres tall and weighs about 60 tons. The O-Torii has four legs providing stability, making it unique compared to other torii gates in Japan. You might assume that the torii’s posts are buried in the seabed, but in fact the torii stands from its own weight. The upper part of the torii is filled with roughly 7 tons of large stones, helping to balance and secure the gate.